As of late I belong to a pretty hip social group. It is mentioned in the media, Hollywood stars love it – and even the fashion world has offered it a runway, in the truest sense of the word. I can hereby proudly declare: Everybody wants to be part of the in-clique. Yes, feminism is en vogue. 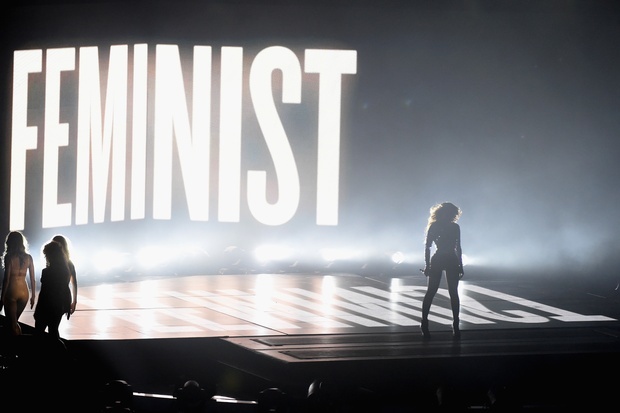 Who could forget the moment when uber-pop queen Beyoncé Knowles posed dramatically in front of a gigantic “FEMINIST” banner at last year’s MTV Video Music Awards? Wherever you’re looking: feminist messages. Miley Cyrus is, according to herself, “the biggest feminist in the world”. Emma Watson gives a speech on gender equality in front of the UN. Karl Lagerfeld, at the end of his fashion show for the Chanel spring collection 2015, sends models with labels and megaphones onto the catwalk. They declare “Feminist but Feminine” or “Boys should get pregnant, too”. But what does all that mean? Perhaps, simply, that at the moment feminism is suited perfectly for advertisement purposes. Firstly, the message of self-determination and power always works. Secondly, embracing the feminism label doesn’t require a real attitude – everybody can do it. Lagerfeld realized that and used it. In contrast to Beyoncé Knowles, who penned the article “Gender equality is a myth!” for the reputable Shriver Report, Kaiser Karl hasn’t distinguished himself through any awareness of gender issues. On the contrary. He considered the singer Adele too fat, and naturally no one wanted to see “curvy women” on the catwalk. People like Knowles and Watson take a stance – the Chanel campaign only shows that feminism can mean everything today. Or nothing. For many feminists, myself included, this is enraging. All at once, feminism seems harmless, nice and suitable for the masses. It’s a bit like when your favorite indie band is suddenly playing on stadium stages. On the one hand. Because on the other hand, this evolution also makes me a tiny bit hopeful. I imagine a young girl seeing pictures of the Chanel show and thinking: “Cool!“! Not because she wants to have the clothes – but because she reads the (certainly ridiculous) slogans and starts to give them some thought. Because she admires the attitude. Maybe the girl saw Emma Watson’s UN speech too: how the clever Hermione is standing there and challenging men to also participate in the fight for gender equality. Feminism may be a temporary trend for many, a trend with which a lot of money can be made in the best case (or the worst case?). But of every trend something remains. The roads leading to feminism are manifold – and hey, if one of these roads leads via a Chanel show, then that’s just how it is; the feminist movement can really use every possible support. The Chanel spring collection 2015 will be largely forgotten in autumn 2015. Unlike feminism.